Chickpeas are a great source of vitamins and minerals. Chickpeas are a great source of vitamins and minerals. The trouble with them is that I don’t really like them because of the odd, dry, floury flavor. Salads with chickpeas didn’t fit at all. I have been improvising for a long time, tried various recipes, and finally, I found one that is delicious! 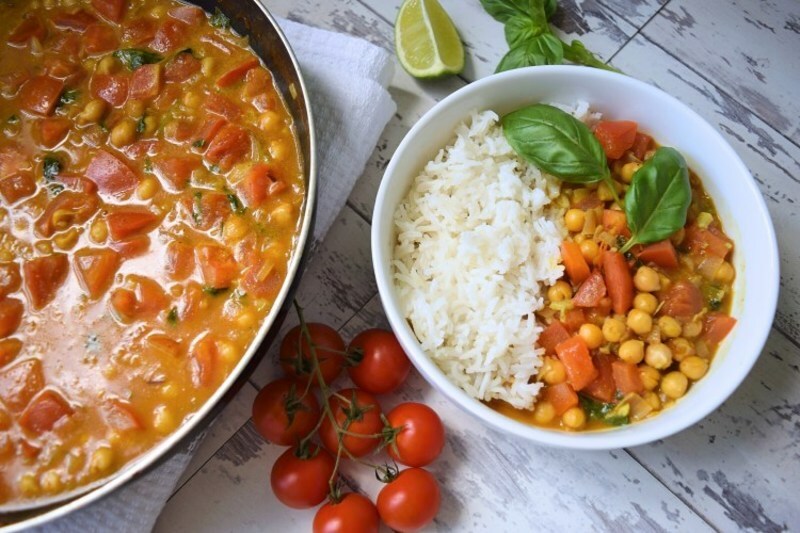 This is an Indian curry with chickpeas and tomatoes in coconut milk. Mostly I cook curry when I don’t want to eat meat. Want to try it out? I recommend! Boil rice according to the instructions on the package. Prepare vegetables: chop onions, garlic, basil and squeeze some lime juice. Heat the frying - pan, pour some olive oil, heat it, and pour chopped onions, cook for about 5 minutes until it's softened. Add garlic, and cook for another minute. Put one tablespoon of curry paste in the pan, pour coconut milk and mix until solid mass. Taste it, if there is lack of flavor, put another spoon of curry paste or some salt. Pour the chickpeas (without liquid) and add the soy sauce, stir and cook on medium heat for another 5 minutes. 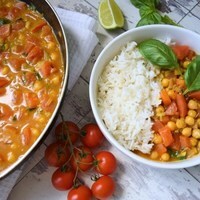 Add chopped tomatoes, basil, and lime juice stir and let it cook for 2-5 minutes, or until the tomatoes are softened. I got rubbered tomatoes, unfortunately, they never softened. Add the maple syrup, you can even add another spoon of soy sauce, stir and turn off the fire. Rice should have been cooked, so serve curry either on or near the rice.